Titanium & Cable Polished 7mm Wedding Ring Band Size 8 by Edward Mirell. Comes in a Beautiful Custom Edward Mirell Ring Box. Features: Polished - Titanium - Black titanium. 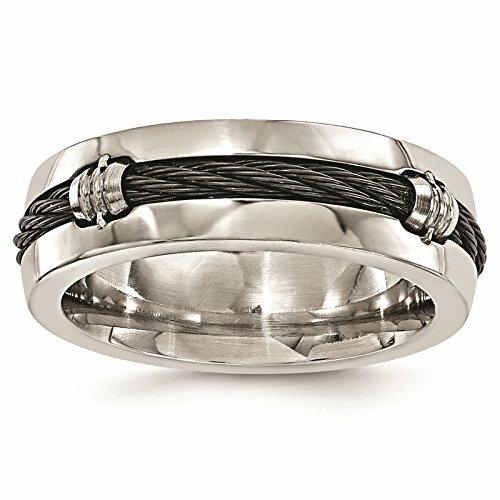 Edward Mirell is a line of premium contemporary metal jewelry for men and women featuring a large assortment of wedding bands in titanium, Black Ti, and Timoku. Some pieces in this collection are accented with sterling silver, gold, diamonds, and other gemstones for added impact. * Titanium name derived from the rich mythology primarly connected with the ancient Greek gods and name after the Titans. The Titans were known for their extreme and superior strength, as is the metal. * Titanium element is not only hypoallergenic, it is extraordinarily biocompatible. * Titanium jewelry is a great choice for those who have allergy sensitivities. * It is corrosion and scratch resistant and has the highest strength to weight ratio of any known element. * Titanium's biocompatibility makes it the metal of choice in the medical industry as a component for the artificial heart, joint replacement parts and various other applications. * Due to its superior strength to weight ratio titanium is used in high end racing applications. * Edward Mirell also proudly incorporates Black Titanium Cable into its creations. * It is considered a memory alloy, as it maintains a predetermined profile under severe abuse. It is for this reason that titanium memory cable is widely used in medical and optical industries. * The cable is made with 74 strands of titanium wire that, to touch, possess a soft and silk-like feel. * There are many casted and low-grade reproductions, but few, if any, deliver the same look, versatility and quality as the Black Titanium Memory Cable used in the Edward Mirell collections. If you have any questions about this product by Venture Edward Mirell Titanium Bands, contact us by completing and submitting the form below. If you are looking for a specif part number, please include it with your message.